After seeing the Southward Stop Shirtdress on TV last night, I really really wanted to wear mine today. But, I didn't. I held back because today was a meeting-free day, and my plan was to write and read at Starbucks in the University Village Shopping Center. This would serendipitously give me the chance to take a break and visit the sale section at Anthropologie at the end of the day before going home (I realize it's not actually serendipitous since it was planned, but I'm going to pretend that it was just happenstance...hehe). Why should this keep me from wearing my dress? Well, it shouldn't, but I'll try to explain my (admittedly unreasonable) logic. I feel weird going to a store wearing clothing from that store - especially if it's clothing still for sale at the store. As far as I can tell, I have this ridiculous rule because 1) I tend to get mistaken for a store employee when I wear clothes from the store, and 2) I have a fear that someone will think that somehow I am shoplifting (probably a completely irrational fear, but I just get anxious). So the only one left in the store was a size medium, and it was huge on me! So I had the store call customer service and ordered an XS shipped to my house. I got free shipping because they didn't have that size in my store! Sweeeet! I did try on this in the store. 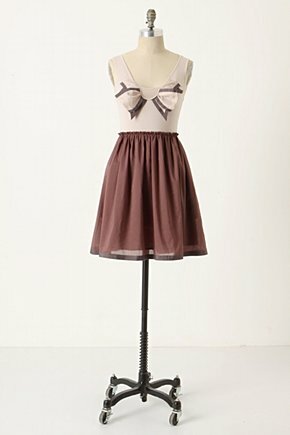 And I think I want it, but I tried on a 4 which was too large. But, I was in too much of a rush to get home and back to work. So I didn't check to see if they had a smaller size (I'd guess that a 0 is probably the best size for me in this since it ran so large). 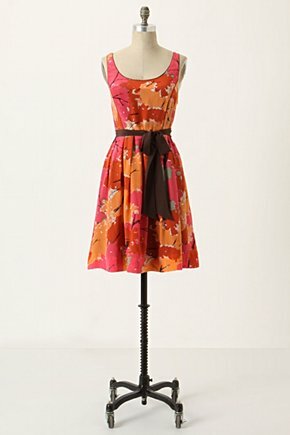 I fell in love with this dress online because I have a vintage dish towel from We <3 Vera that has a similar pattern and colorway! Plus, the fabric of this dress was so lovely! Reviews will be forth coming, I swear. I've used that same logic myself! Especially going into Anthro since their pieces are supposed to be "unique" and then you pass the rack full of the same item you're wearing and two gals also wearing the same thing! Though if I happen by an Anthro and hadn't originally planned to go, it ain't stopping me from going in - but I know what you mean! Hehe, I can totally understand what you mean about wearing clothing to a store that has the same clothing item instore. I wore one of my Anthro dresses to the UK Anthro and it felt slightly weird, even though that dress was no longer instore! I don't think i would have worn it if it was still sitting on the racks. Nice OOTD by the way - the pops of blue add a bit of quirk to it! I have that same weird feeling too, even though I ration with myself that if you wear their cloth, that means you are more likely to buy, so you might get better service. I love the little pin. I have yet to learn how to use a pin to spice up an outfit. I love the idea of matching blue socks and headband! My sister always tells me it's only justified to wear colorful socks over tennis shoes, but I do wear them very often with my dress shoes~and I love you doing the same thing too! Plus they keep my feet worn at work! I totally understand that feeling, I always feel like I'm being judge or something lol. Don't you just love the university village Anthropologie and starbucks? Those two are my favourite stores in that mall. Whenever I am down in Seattle, my fiance always takes me there, and then he wanders off while I am in Anthropologie, or sits on the couch. When i was much younger, I had the same weird thoughts about wearing clothing to the same store I bought it from. That was because I didn't like drawing attention to myself. I prefer to not be approached by the store associates. I never like what they pick out for me. I think OCD is a common blogger phenomenon. That pin is adorable I am really digging pins and brooches lately! Don't worry, I too feel weird wearing anthro sale clothes (current sale) to the store too. I get all shy and self conscious. @vintageglammz Thanks! You know me, always throwing bits o' color in! @Jennifer and Sherry Thanks! Me too. Learned it from my parents. I'm ever the deal hunter! @InkMark ooh, I never thought about how it might get me better service! I have taken a cue from watching Mad Men on pin placement. They have some GREAT ones! @Jess Yes! Both Anthro and Starbucks there so beautiful. The way the redid the Starbucks with the wood walls and dark color scheme and mid-century furniture is lovely. Plus, they have a clover machine and free wireless! @GeoInCalifornia It's true. I'd totally believe that I'm a little OCD! I'm very behind in reading and commenting, but I'm so glad to hear that you might be able to get the Changing Canopy dress in the right size. I think it would look fabulous on you! 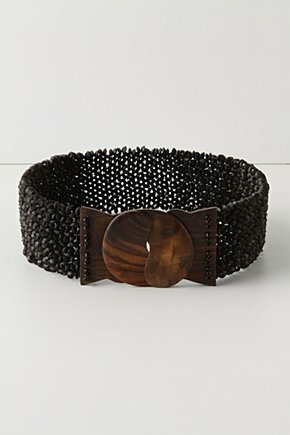 And the Tellicherry Belt is beautiful, especially with the wooden buckle. Just the right amount of "earthiness". I found the Impressionist's Dream dress for $40 (marked down from an insane $178!). It was the last one, it was in my size, and I had just received a surprise Anthro card as a belated b-day present from my cousin. So I think it was definitely meant to be! And the teal color scheme feels so appropriate for this time of the year (much more of an autumn color than a spring color). I can't wait to wear it! @Jamie wow congratulations on finding the Impressionist's Dream Dress! It's such a pretty dress, and what a sale score!